Haven’t posted on here in a while, but thought I would give a quick update. I had my surgery from a full achilles rupture on March 13th this year and it is now October 15th. 7 months! I am pretty much fully recovered. My left calf is still weaker than my good (right) leg, but I have started to lift legs at the gym, do weighted calf raises and run every day. I can easily do single leg calf raises with my bad leg but I still have less strength than my right leg. I am not playing sports or doing aggressive cutting/jumping, but that will probably come soon enough. Most mornings my achilles is still stiff until I walk around for a bit and it warms up. Sometimes it is sore after a workout or run, but not much pain. I ran my first mile at about the 6 month mark and I can pretty much run without noticing it now. I’m just out of cardio shape…so running is a pain anyway for the lungs haha! Hey everyone, 19.5 weeks post op and everything is getting slowly better. I am able to do a singe leg calf raise but I can’t quite hold it…so its just a split second. I can jog but not for very long before it starts hurting. I still feel how tight my achilles is constantly, but I am just happy that I am able to do everything necessary to work and be back to normal life. Looking forward to running again. I have a feeling it will be another month…especially since I am scared to even try it. 14 weeks and 1 day post op. I’m feeling good about the progress I’ve made over the past 2 weeks. I am barely limping anymore when I walk and I’m feeling less pain during the day. When I go to the pool, I’ll do single leg calf raises in about 3 foot deep water and simply walk back and forth pushing off with the front of my foot. PT is twice per week and I’m getting stronger with more mobility each session. My goal was to start jogging lightly by week 15. That seems pretty realistic at this point, but I am a little scared to try it. The last thing I want to do is re-rupture. I see the doctor again at week 16 for my last checkup. I’m hoping for good news. I am ready to put this all behind me and get on with my life again. It feels like everything has been on pause for the last 14 weeks while the rest of the world has moved forward. Today marks the 12 week post surgery. I am walking around in shoes pretty decently but I have a significant limp because i can’t quick roll my foot on my toes. I started PT about a week ago, and I’ll be going to that once per week. So far, they are massaging my tendon, stretching my foot, making me do some weighted squats and some other basic things. I am worried that I still have such a limp when I walk. I figured that around the 3 month point I would be walking normally. Does anyone else still hobble around at week 12? As far as progress goes, I have made some significant improvements since week 9 when I was cleared to walk in shoes again. I am getting around much faster. Each day gets a little better, but too much walking makes it sore for the entire next day so I have to take it easy for a while. I went to the doc today at 9 weeks post surgery and got cleared to start walking without the boot. I’m not gna lie, I have been walking around the house without the boot slowly for a few days already. Things are feeling pretty decent. My flexibility is still pretty limited but it gets better slowly every day. I am going to try to make tomorrow with only shoes and see how it goes. The doc also said I could officially start PT, so next week I’ll probably have an appt. I am never touching those crutches or boot again. I tried to fly the simulator (Im a pilot) yesterday but it was pretty awkward to use the rudder pedals with the boot, and the brakes are difficult to push with my week leg. Im hoping to fly again by the end of June. I saw the doc this week for my 6 week post op appt and I got cleared to put weight on my foot and start walking in the boot. The doc said to begin relying less and less on the crutches as pain allows. So the past few days have really gotten my spirit up because i can finally stand on two feet! Will probably celebrate this weekend by using a crutch in my right arm and a beer in my left hand on Saturday. Today marks my 5th week post op. I have another appointment next week to transition to PWB, probably. Right now i am still pretty numb on the outside of my foot. I can move my ankle around slightly, but the ROM hasn’t really improved much in the past week…but I’m not really pushing it too hard. I take off the boot while I am at home just sitting on the couch/bed. Does anyone else do this around week 4-5? I sleep in the boot because i’m nervous about twitching. I am thinking about getting an MRI to make sure the surgery worked and everything is in tact how it should be after the surgery. Has anyone else done this? I don’t know if it just an irrational fear…but I always feel like it didn’t work and my achilles isn’t put back together. Below is the link to a picture of what my achilles looks like right now. You can see the huge blister on my heel…which is wonderful looking. I am at 4 weeks post op and I just got my cast off today. I was supposed to be in the cast until 6 weeks but I asked the surgeon if it was ok to get the boot early because the cast was loose. I also stepped on my bad foot on friday so I wanted to get it checked out…I was feeling a little bit of pain and throbbing right on the bad achilles which I hadn’t felt before. Turns out everything is OK and I now have a boot. I took the day off work and I showered, cleaned my leg, and have been letting my foot breathe today. It is nice to move my ankle around slowly. The atrophy in my calf is pretty substantial. It is going to be a long road to recovery. One complication that I have is a large blister underneath my heel bone. When I was in the splint for 2 weeks, I had a painful burning sensation in my heel and I called the nurse, who told me not to worry, “It is just the nerves coming back to life”. It turns out that the splint was irritating my heel and now I have a huge blood blister. I don’t think it will delay the timeline to get back into shoes, but will take about 6 weeks to go away. Overall, the wound is healing well and i can move my foot up and point my toes slightly. The other complication is nerve damage on the outside of my foot. It is fairly common to have slight nerve damage after this surgery, but unfortunately mine is the entire outside of my foot from heel to toe. The doctor says this should come back in time, but to avoid areas with people who smoke (and not to smoke either). NWB for another 2 weeks. Then PWB. Then hopefully some PT. I am 3 weeks post op and I’m in a cast. I was pretty thin before this surgery, but now my quad is very skinny compared to my other leg and the cast is appearing loose. I am very eager to get out of this thing and start rehab. I have heard some different timelines from multiple people, but I was curious if it is possible to be starting PT at about the 7-8 week mark? I will be PWB at 6 weeks post op in a boot and I plan on getting an aggressive PT plan because I need to get back to normal. When will I be able to start PT? When does the appearance of muscular atrophy go away? I am 17 days post op and I have been going to work all week. Things have been feeling better and I can move my toes and foot around a bit more in the cast. However, I’m worried about re-rupturing my achilles just from flexing my foot and twitching at night while sleeping. 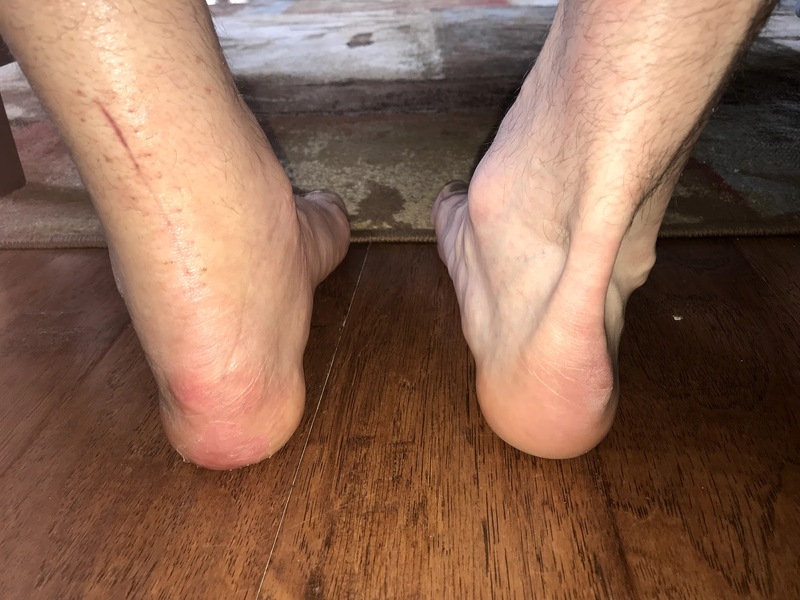 Has anyone re-ruptured their achilles at this stage post op? I don’t recall any heel pain from my right foot. I’m at 9 weeks for my left foot (same surgery as you) and get a pain at the base of my foot, on the side, on the inside but nothing that advil or elevation won’t fix, fortunately. You should probably check with your doc, especially since the pain needs a pain pill. If your surgery was like mine they used anchors to attach the achilles at the heel. One possible side effect is that your body doesn’t like the anchors. Not a likely side effect if you already had your right foot done. But only your doc will know if the same type of anchor was used in this surgery, if any anchors were used. Hey all ! I am 14 weeks p/o from an Achilles repair/Haglund resection. I am in more pain now than I ever was. This is so frustrating. I finally went back to work at 13 weeks and to walk is unbearable. I live to come home and take a pain pill and get off my foot. I ice every chance I get, still in therapy three times a week and rest when I can. I have tried heel lifts , multiple pairs of shoes and still no relief. The pain is mainly on the bottom of my foot at the heel. Scar is still really sensitive also. I am doing desensitization techniques as well. Any boy else with this horrendous heel pain? I need suggestions. I had my left done two years ago and do not remember anything like this. Thanks for the follow-up email - that is insightful. I know everybody’s progress is at a different rate and they have different marching orders from their doctors, but it’s nice to kind of get a feel for some common ground on everybody’s recovery and what they’re experiencing. Hope your recovery is going well. I’m at week 9 now on my left foot. Still in a boot 4 hours a day but next week I’m 2 shoes 100% (with heel lifts of course). It was good to read your update, because I was curious at what type of strength, pain, and range of motion a person would have at about seven months recovery. Your activities that you described are something that I am continuing to look forward to. What point do you remember being able to do a single heel raise. I am at 13 weeks and can not do one unsupported? Well, 19.5 weeks is rather early for many things in the recovery process, including single-leg calf raise. I am 6 months post-op (i.e. roughly 7 weeks ahead of you) and I am not there there yet. Be patient, as recovery is getting faster at later stages. Just don’t push it too hard, but don’t just sit on it, waiting for it to heal on its own. I just read through your blog and saw a lot of similarities with what I am dealing with from my surgery on July 12, 2018. What type of procedure did you have - Krackow, PARS, Speedbridge etc.? Your latest post gives me a lot of hope on getting some type of normalcy back in my life, because only being here two weeks post op, “recovery “seems so far away. Eager is right! I’m two and a half weeks post-op. The atrophy is quite stunning. At least two and a half weeks until I’m partial. I’m still sleeping with the boot (very loose), but it is really nice to take it off a 4-5 times/day for some light stretching and ice. Man, do I love the ice! 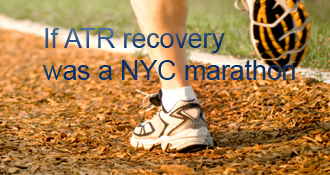 Great to hear you are progressing and also seeing your goal of jogging come into view! Also nice to hear you are in the pool — I am 4 weeks post-op and hoping to follow in your (ahem) footsteps! Best of luck! Thanks for the advice on the pool exercise. I started doing that and I love it. It helps build strength too with calf raises. jarrodfrommich, I’m really sorry to hear that happened to you! I hope the damage is not as bad as you think and that you will be able to continue with the recovery. Please keep me updated with what the doctor says. I think it is interested the different stories people have. My physical therapist said, and I’ll quote him, “It is very low probably that you will rerupture your achilles at this point” as he stretched my foot upwards. I dont mean to alarm anyone, but I was at 10.5 weeks post OP this past weekend, 3 weeks since getting the cast off and 2 weeks in mostly shoes. Well I was walking in my yard on Saturday and stumbled while watching my dog. I took a large step with my bad foot and felt the pop again… I have an appointment tomorrow morning to see how bad the damage is. The gap is about an inch higher this time near the top of the sutures. I dont think it is a complete tear, as I can still flex my calf though. It is so hard to think positively right now… Anyway, be careful and I hope you continue well with your recovery! I ruptured around the same time and still walk with a limp as well. Not sure if I would call it significant but it is definitely there and noticeable. It gets worse depending on shoes and whether late in the day or not. I also completely stiffen up when sitting down which then gets me to limp when i get up and have to start walking around again. My physio wants me to focus on my walk for the next 2 weeks rather than doing aggressive training for my leg. I found that the pool exercises help / especially heel raises in the water. She cautioned me against doing too much as I need to be fit for my Rockies tour in a few weeks and cannot reinjure myself. She advised that simple walking also helps as long as i am focussing on the correct gait. Probably nothing new in my answer but just to confirm that you are definitely NOT alone. However, I am pretty confident in my achilles right now…there is still a slight gap (indentation) in my achilles but it does not hurt and I am walking pretty decent right now without a boot. I have a limp, but that is because i can’t really step forward on the toes when I walk. @popouch - I remember you and I are close in timeline. You mentioned that you had a small gap in your tendon and went in for an MRI - did you ever hear anything about that gap? I’m going in tomorrow for an MRI (almost at week 11 now…) and am just now getting to one crutch with the boot on (been weight bearing for only 2.5 weeks). That’s awesome for you. I’m 8 weeks post op and looking forward to just walking again. Click on Remain to finish your enrollment. DirectV on Directv website. Launch your internet browser and also get in the URL as in the address bar of your browser. I have been seeing a PT for the last month and a half, twice a week and frankly I am not quite sure I am any farther down the road of recovery as you are. I have a PT apt today and will be bringing my shoe with me as today is the day that my shoe will be introduced to back into the mix. My foot is tight and still can’t do any foot alphabet motions. Plus my heal has pain, when I try and walk without the boot and still have numbness at the ball of my foot. Good luck and will be curious to read how you progress. It is realizing good feelings, How much it is positive to work on and weight bearing also. Congrats. congrats! it feels so good to get going on weight bearing and then to one crutch. your incision healing is great. i’m worried about mine as it is a little bumpy near the heel. i’m hoping with some PT and some massage and time it will flatten out. are you using a specific ice method? I have some numbness on base of my big toe and heel, other than that i have decent ROM on my ankle although it’s very weak. I’m on 5th week post-op, had my cast removed and into boot just starting this week. Your numbness is normal - I was numb on the outside of my foot including the outer 2 toes, but you will gradually get the feeling back. When you let your leg out the boot, feel the Achilles. If there is tension then you’re good (and from the photo it looks like there is). Surgery is quite effective at keeping the ends together so the tendon can heal - it’s very slow but you just need to sit back and let your body work on it. It will get there. I am about 3 weeks post-op (Speedbridge) and have been back to ortho for one post-op appointment where sutures and plaster splint were removed and I was placed back in the boot I had been in pre-op. Regarding the boot, I was given extremely specific instructions to only take it off while showering (in a chair, no submerging until incisions are completely healed) and to not do ROM until/unless directed otherwise at my next ortho appointment. I feel for you because there are so many different opinions on the recovery process and you seem to be trying to figure it all out and navigate on your own. Have you been given the support and instructions you need from your ortho team? I understand your concern about how effective the surgery was; have you spoken to your doctor? I don’t know that you’ll find anyone who has gotten an MRI without an order from their doctor. Your fears are not irrational, Popouch, we’re all right there with you! After surgery I was numb on the outside of my foot from below the incision through the outer two toes. After a couple weeks, the numbness started receding quickly. I’m 8 months out and now just have some partially numb area on the outside of my heel. I had some unhappy nerves on the outside of my foot too. Mine was mostly around my ankle. Eventually those nerves calmed down. I still have one, sort of numb, spot on my heel after over a year. It’s around the scar area. It gets a bit less numb over time but still doesn’t feel quite the same as the other heel does. So - nerve damage does heel after a while but some things take a very long time. And - if you read my blog - the “PT” I got at six weeks were just some basic rotation and stretching exercises the doc told me to do. At each visit the doc gave me a few more exercises to do and a few times I emailed him to ask if I could do some others. Some he said I could, some I couldn’t. I didn’t actually go to real PT until I was fully weightbearing which was at maybe 10 weeks? Glad you’re in the boot popouch! I was sooo happy to get in the boot too. Since my post-op instructions said come in if you have any issues with the splint/cast I did exactly that - LOL! As soon as I felt some continuing discomfort I went in for a change. Once I was just starting to get a raw spot on the top of my foot. Had I left it alone it would have turned into a bloody raw spot on the top of my foot. Once I was in the boot I could put on nice soft socks FYI - if you want to keep your boot from being scrungy - always wear socks - make sure the go up to the top of the boot too. Thanks for the responses, emupilot, afkv, and pjhalifax and cserpent. I was just freaking out a little bit, and I think i finally started getting very frustrated that I did this to myself. For an update, today I went into the doc and complained about my cast because it was very loose. Also, on friday I fell and put weight on my bad foot, causing some pain. I wanted the doc to check it out. He said everything looked good on my achilles and told me to take it easy. I begged for a boot instead of another cast and he agreed. So I immediately went home, and took a shower..washed my leg and rubbed my calf. One thing we noticed at the doctor was a pretty bad blood blister under my heel. Remember I mentioned some pretty awful pain the first 2 weeks after surgery under my heel? Well it turns out that it was actually the splint that they put on after the surgery. When I called to complain about the pain a nurse told me it was just the nerves coming back to life…but turns out not for me! Just a lesson learned…if you are in any discomfort make sure you insist on getting it checked out. As others have pointed out, PT starts when the doctors says so. My rupture was at the top end of the tendon and didn’t start PT until 13 weeks. I’m 8 months out now and one calf is still significantly smaller than the other. sorry there are some typos! i cant’ figure out how to go back and edit. i’ve also been doing some cat/cow and one-legged down dogs to get the blood flowing. also i’ve been doing some push ups on my knees, on my bed where it feels safe. i’ve added in some upper body work out with some weights and exercise band. i guess i’m just getting board sitting here. i live in a house but the entrance is up steep stairs and i also live in a neighborhood with no sidewalks and lots of hills. i haven’t ventured out much because of it. i hope to start work next week (2w5d post op). i see my DO in 6 days, 3w1d post op for stitches removal and hopefully PWB in this boot, i have the vacoped. i don’t have any swelling, but i’m not getting up and about much. i do have some heel pain and what i think is incision pain, but no redness or fever so i hope it’s ok.
As cserpent said, hard to know a PT start time because of how we all vary in our recovery. I started PT at 6 weeks post-op and they gave me basic range of motion exercises…I couldn’t do much else at that point. My foot barely moved at all! In hindsight there was no need for me to burn PT visits on my insurance that early (I was limited to 18 or 21 or something like that). In my case it took a good 5-6 months for me to stop noticing swelling. I wore a compression sock to help manage the discomfort. But it definitely got better over that time - it wasn’t like the swelling from the first few weeks continued for months and months. As far as atrophy goes, I’m at the one year mark and my calf is still a little smaller than on the good side. What surprised me most was how much I lost in my quad/thigh area. I’d say that evened out a few months ago. I think the leg lifts, clamshells, and other strength/mobility work helped with that. Good luck on these early stages! Life will be so much better in the boot. I hated my cast soooooo much. It takes months for the muscular atrophy to go away. And, possibly, your calf will never be as big as your other leg. As to PT - it’s up to your doc since only s/he knows what kind of repair was done and when it is ready for PT. I was very intolerant of a loose cast /splint so I was in getting mine changed about every 5 days - LOL! The cast will limit the motion so you can’t rerupture. I worried about the same thing - LOL! My doc said wiggling the toes/foot is OK while in the cast. Don’t try squeezing the toes (as though you pick something up), but wiggling is OK.
i can’t believe you are in a cast! i would lose it. i’ve taken it apart a few times to adjust the beads inside and kinda figure out the straps a one was causing some friction at top of my foot. i have really skinny ankles and feet. it feel amazing to massage my foot and calf and let it breathe. i asked if i could take it off and open my leg to air and light and she said yes but only in bed and keep leg in boot with just the flaps open, so, that’s what i’ve been doing. i go back to work after two weeks post op, so next thursday and friday. I am surprised that you are in a vacocast boot already! Are you able to take it off when you like? I am tempted to ask my doctor if I can have a boot earlier, rather than this cast I will be in for 4 weeks. I am able to move my toes a lot more now and flex my foot a little bit more so it seems like things are healing nicely under there. I have been going to work everyday this week and I still feel it swelling up when I get up on the crutches. I just can’t stand being at home anymore. When I get home, I just elevate my foot and it feels better. hey that’s my achilles rupture date too. i haven’t started writing about it yet though. i had surgery March 20th. i’m in a vacocast boot now after 8 days post op. i had that heel pain after i had surgery too and i loosened the splint dressing which helped. i go back week three to get stitches out. i should really start my blog but i have family coming in for easter. i look forward to hearing about your recovery. I missed out on the audible pop when my Achilles ruptured, but like you I knew what happened right away. Being NWB really stinks - it’s boring being on the couch with your leg elevated and you miss just being able to stand on two feet. The good news is that each day is better than the last, and your Achilles will heal. Unfortunately, it will take alot of work to get that calf muscle back once you are back on two feet, but don’t try to be a hero and let your body heal for now. Thanks for the detailed introduction, and please keep us posted. popouch’s AchillesBlog is proudly powered by WordPress and WPDesigner..